I suppose that in some cases, size is a major factor. Although we cannot discount the fact that a lot of pleasure can also be derived from tiny things. It really all depends on the situation! In the case of the game Scrabble, I am not quite sure how size comes into play. Then again, that’s just me. This guy, John Kahn, apparently goes by the maxim “the bigger, the better”. One look at his creation – the world’s largest Scrabble game – and anyone will come to the same conclusion. The world’s largest Scrabble game is nothing to scoff at – size-wise – as it measures in at more than 49 square feet. That is almost five times the size of the original Scrabble game! You know, the one that fits on a normal coffee or dining table. The kind that we all probably grew up with. This board will definitely not fit many tables, and as such, it has been designed to be wall mounted. Kahn has made only nine of these boards, all of which are made from Russian birch plywood. (Not that I know all about the different kinds of plywood!) The back board is three-fourths of an inch and has the same color – purplish – as the original board. To reinforce the humongous board, Kahn used a 0.023 gauge galvanized steel sheet. The playing side is made with a vinyl print, which is also protected by a satin laminate. This giant baby is not going to break up on you any time soon. 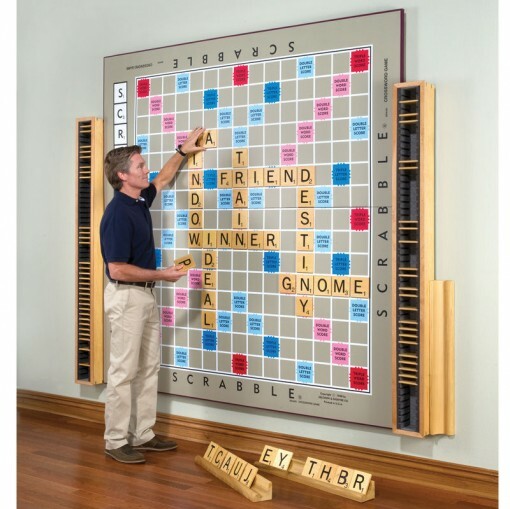 The world’s largest Scrabble game comes with two felt-lined tile racks, each of which can hold 50 tiles. Each of the tiles (100 in total) has a rare earth magnet in the middle, covered by the same kind of plywood used for the board. And to make sure that the letter markings will last forever – or at least long enough to pass on to the next generation – protective finishing has been applied as well. So, is that impressive enough for you? Now for the damage. Shell out $12,000, and you can be one of the few owners of this nine-of-a-kind game.